From sensual grace to magnetic femininity, the master perfumer, Olivier Cresp, has recreated the quintessence of Valentina with an intense fragrance adorned with a chypre signature. A magical formula that comes to life on the skin and transforms into an unmistakable and necessary final touch: a designer fragrance. 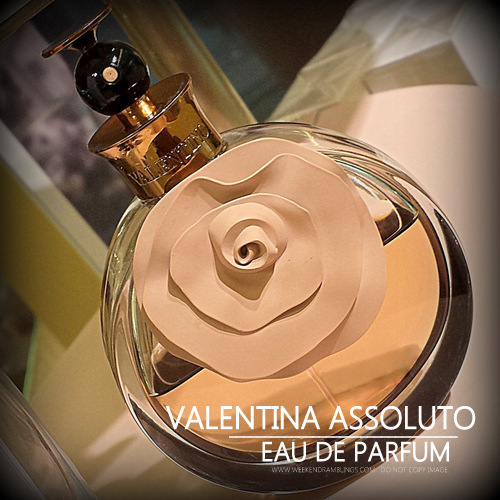 A sweet, sensual fragrance with hints of a floral sweetness to it, Valentina Assoluto seems like a tuberose-jasmine scent that I might actually like. The base notes of oak moss, cedarwood, and patchouli blend beautifully with the floral-fruity opening notes to make this a lovely perfume to try for cooler fall months. Top notes: The alluring fruitiness of sensual smeggia peach enhanced with the luxurious Alba truffle. Middle notes: The magnetism of a precious bouquet of white flowers (jasmine, tuberose and orange blossom) magnified by a delicate vanilla. Base notes: The mystery of a voluptuous chypre signature, fusion of magnetic patchouli, oak moss and vibrant cedarwood. Any new perfumes that caught your eye recently? Do share!